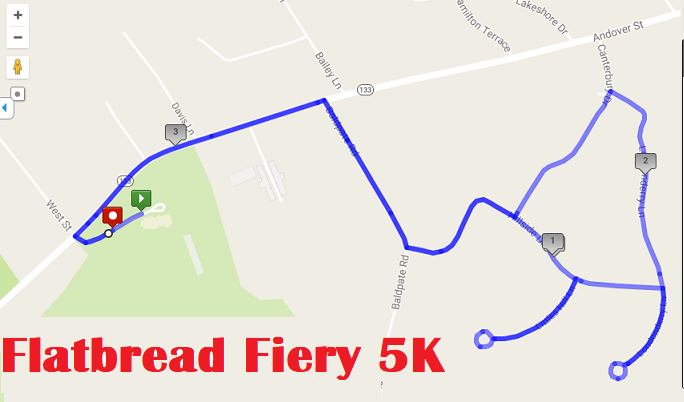 Description: 3rd Annual Flatbread Fiery 5K race for pizza and beer. Be the fastest female or male runner to cross the finish line and WIN FREE pizza for a year. In our first year, over 150 people participated, last year over 200 joined in this fun event followed by AN AWESOME after party on the outdoor back patio overlooking the Black Swan Country Club greens. Packet Pickup/Race Day Reg: 5:00-6:30pm at race site. There will be no early packet pickup unless otherwise noted. Team Category: Own a business? Part of a running club? This is an easy and fun way to recruit your friends. Teams must consist of at least 4+ people. Prizes will be awarded for the Largest Team. Course: The event will start/finish at the Flatbread Co. The course will be open to traffic, but once you turn off of 133 it’ll be very quiet. The course is a mix of flat/down hill and one good climb just after mile 2 on Canterbury Dr. You will have one opportunity for water at the half way mark. Walkers, dogs, and strollers are welcomed. Kids Fun Run: This Kids Fun Dash is targeted for those 8 and under starting at 6:15pm. This category doesn’t include a race t-shirt. If your child wishes to participate in the 5K and the Kids Fun Run please sign he/she in the Youth Under 15 category so he/she will receive an official race time in the 5K. Swag: Participants will receive a custom designed race bib, short sleeve shirt, pizza, and a complimentary beer. Shirts will be guaranteed to those pre-registered by 5/10. Post Race Festivities: Bring your family and friends for a FUN Friday night at Flatbread Pizza Co. with the very best pizza, great beer, lawn games, kid games, and summer tunes! The Erie 4 Fire Association will have their truck on site so kids have an opportunity for kids to explore the truck. Beneficiary: ERIE FIRE ASSOCIATION NO.4, INC. (www.erie4.org) “Warm Hearts – Willing Hands”. The membership of Erie 4 is made up of volunteers from the local community. Erie 4 is the Oldest Privately Owned Fire Company in the United States. Erie 4 was formed in the year 1854 for the purpose of protecting property from fire in the so-called Byfield District of Georgetown and Newbury, Massachusetts. Weather: This event will take place rain or shine! There will be no refunds. © 2017 Rising Reg, LLC | All Rights Reserved.